NEW YORK, 24 MARCH, 2016 – Her Excellency Toyin Saraki, Founder of the Wellbeing Foundation Africa, today spoke of the need for legal frameworks to protect the rights of women for a sustainable future at the Women in Sustainable Development: New Legal Frontiers side event at the United NationsConference for the Status of Women. “The long-term economic success and wellbeing of nations rest firmly on the shoulders of addressing structural issues of gender parity and equality,” Mrs Saraki said. “The international data speaks for itself. If we strive for sustainable long-term economic development, then we must take a robust approach to address inequality," she further stated. In discussion of the recent failure of the Gender and Equal Opportunities Bill in Nigeria last week, Mrs Saraki wryly noted that such an outcome was “Not surprising… [when] only 7 out of the 109 senators were women." Nevertheless, Mrs Saraki remained optimistic to the future of Nigerian legality with regard to gender, stating, “The narrative on the importance of gender parity to sustainable economic growth and economic success is clear… Let us be smart about enshrining gender equality into all economic legislation, whether it’s a finance bill, or development bill or trade bill. Let us work together to ensure that gender parity begins to be reflected in the day to day economic work of governments, legislature and judiciary. Then, gender equality will no longer just be about women’s rights, but will also be about sustainable development and economic success. Cultures, religions, traditions and diversities can all still be upheld in parity, peace and dignity, but economies will not advance if their women cannot advance." She concluded by stating, “The new legal frontiers for women are actually not new at all, but in fact right in front of us — in every country, whether in the United States of America, or my beloved Nigeria. But they are hidden behind the very dialogue embedded around them. It is therefore imperative that we do more." 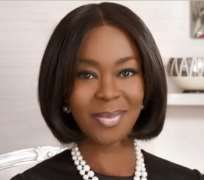 Mrs Saraki’s warm and effusive advocacy was commended by Renee Dopplick, moderator and co-chair of the NGO and Not-for-Profit Organizations Committee of the American Bar Association Section of International Law. Event organisers also thanked the Wellbeing Foundation Africa "for dedicated and ongoing efforts to advancing women’s rights".